On Thursday, two students and I will present a workshop on “Exploring Student-Designed Assessment” at the Pan-Canadian Conference on Universal Design for Learning. If you’ll be at the conference, please join us! We hope to take UDL’s “multiple means” to a new level: how much of the assessment strategy can students design themselves? We’ll explore how Standards-Based Grading can be used to turn over that control, by letting students apply for reassessment when they’re ready, as often as they are ready (up to once per week), and in the format that they choose. For a more detailed exploration of how this connects to UDL philosophy, see my previous post. Why Should Students Design their Own Assessments? Tim Bargen, one of the students with whom I’ve co-designed this workshop, values the aspect of UDL that prioritizes offering this flexibility to all students, not just those with a diagnosis or documentation. What do we mean by “Student-Designed Assessment,” and how do we do it? 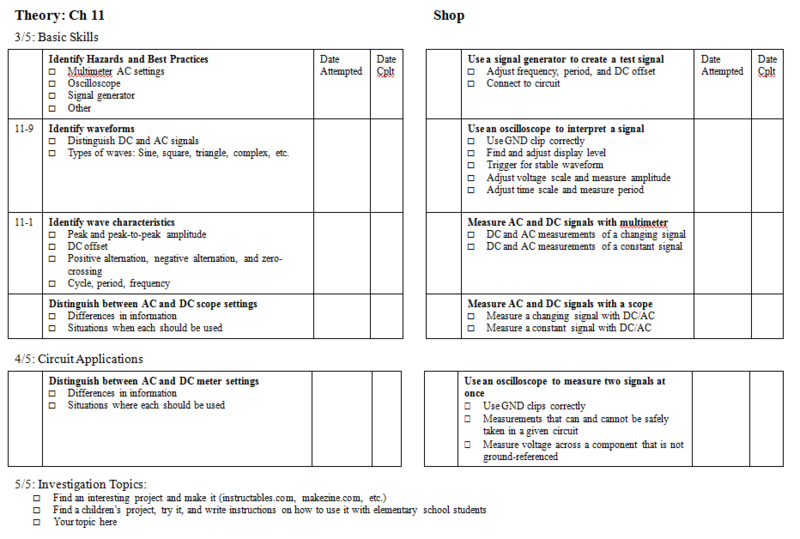 An example of a skill sheet for an AC Circuits course. See handout and screencast for details. Skill sheets are a tracking tool that students use to figure out what they’ve completed, what they need to work on, and what’s coming up next. The magic happens when they are used in the context of Standards-Based Grading. This means that students can choose for themselves when and how to demonstrate their mastery of each skill. If I’m going to encourage students to choose their own format for demonstrating mastery, I have to be ready for anything. No one’s written a folk song about electrons yet, but I’m looking forward to that day. In the meantime, I need a rubric that is as format and content independent as possible. This removes the burden of creating a new rubric for every new thing a student decides to do. In the workshop, we will present example templates and invite participants to design their own. We look forward to meeting you and exploring these topics together. See you soon! Hah. That’s great, and might be just the thing to help students start noticing the “single-file-chain-reaction” assumption that many people (and many explanatory diagrams) fall into. I was thinking of you today. Just stopping by to let you know, a digital hug of sorts.